The new baby cryed as Father took it in his arms and wraped it in a blanket. "It is a girl." He smiled at me and Stefan. "Damon would you like to hold your baby Sister?" I nodded. I took her in my arms and she continued to cry. I whiped a tear away from her eye. "Do not cry." She stopped and looked at me with wide beautiful blue eyes. She had my eyes and hair. "Ah?" I smiled at her. She smiled back and laughed. "Damon, you name her, your the eldest." Mother said to me holding Fathers hand. "Elizabeth." I said lookin at my sister. "Your name is Elizabeth." "Damon, can we call her Eli?" I smiled at him and nodded. "Eli, I am your big brother." She looked puzzled. "Bibuhbuh?" I smiled. She seemed pleased with her self. "Bibuhbuh! BIBUHBUH!!" She shrieked. The entire family was sitting in the family room. I was holding Lizzie as always. Stefan was next to me. We were teaching Lizzie words. But she was not saying any of them. "Say Mother!" Stefan said. Lizzie tillted her head to one side. "Say Father!" She seemed cross. Stefan sighed. "Damon I do not think she wants to talk." "DAMON!!" Eli looked At me. 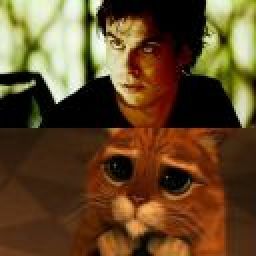 "I wove you Damon!!" She looked at Stefan. "And you Tefan, and you Mother, and you Father!" I looked at her. I was her first word, Damon! I hugged her. From then on, Stefan, Lizzie and I were as close as siblings could be. I woke up to Lizzie screaming in the middle of the night. A nightmare. This has been happening at least once a week ever since mother died. I ran to her room and Stefan was there. I picked her up and she stopped screaming but continued whimpering as she wrapped her legs around my waist. We brought her to my room and I layed down on the bed and she layed her head on my chest. Stefan layed on the opisate side of her and put his arm around her waist. She calmed down and went back to sleep. Stefan and Lizzie fell asleep first. I played with Lizzies long curly hair until I fell asleep. I woke up early in the morning. My head was on Damons chest and Stefans arm was around my waist. They were both still asleep. I got up and quietly walked to the door. "Lizzie? What are you doing?" I turned around, Damon and Stefan were sitting up. "Get back to bed." Stefan said. "I&apos;m gonna get ready for School." I said. "Its three in the morning. School dosen&apos;t start for another six hours. Now come on." Damon said patting the spot next to him. I walked over and sat down. "I&apos;m not tiered." Damon sighed and pulled me to him, my back to his chest. He bit his wrist and stuck the wound to my mouth. I whined and pulled away a little. "Shh... take it." I took the blood from him and I started to get sleepy. "Now are you tiered?" I nodded, still drinking. Damon pulled his wrist away and layed down. I layed down on his chest again and Stefan returned his arm around my waist. Once Damon started playing with my hair I fell asleep. Once I started playing with Lizzies hair she fell asleep. When me or Stefan give her blood its like giving a baby a bottle. We figured that out a long time ago. Then me playing with her hair relaxes both her and me. I smiled at Stefan. "Isn&apos;t she just so beautiful?" He smiled back and nodded. "I wonder, If she had a chance to grow up... would she look like Mother did?" I nodded. "Goodnight little brother." Stefan fell asleep soon after that and I continued to play with Lizzies hair. I pressed my lips to Lizzies head then ruffled Stefans hair again. "You two have no idea how much I love you." I woke up first, at 7 then I woke up Stefan and Lizzie. Stefan went to his room to get ready and Lizzie stayed. "Damon, I don&apos;t want to go to school. I&apos;ve been through the 8th grade too many times." "Lizzie people will get suspicous." "Say that you homeschool me!" I laughed and ruffled her hair. "I&apos;m serious Damon!!!!" "Lizzie..." She crawled towards me and sat, wrapping her legs around my waist. I put my arms around her waist and buried her face in my neck. "Lizze sai che non puoi dire di no quando si utilia il mio nick." Lizzie you know I can&apos;t say no when you use my nickname. "Questo e il punto"  Thats the point. I chuckled and kissed her head. "Thank you!! I love you Dami!!" I buried my face in her hair. "I love you too Piccolo." She smilled into my chest at her old nickname. A/N: Okay they were speaking in Italian and Piccolo means small. Comment and vote!!! I want to know if you like this story!! !